Hello everyone! I'm posting over at Twine it Up! with Trendy Twine today using the new Happy Halloween Stamp set. I LOVE this set and it was fun making these to show you. 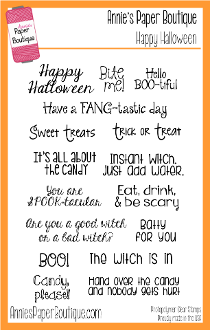 First, I made a card and used the Are you a good witch or a bad witch stamp. I also used some Lime Grapesicle Trendy Twine. The witch is cut from the Wrap It Up cartridge on my Cricut machine and is pop dotted on. I finished it off with some self stick black gems. The green parts of the witch are also sparkly--I used my clear Wink of Stella. Next, I made a drink pack water bottle holder. I really wanted to use the Instant Witch. Just add water. stamp and this was perfect! 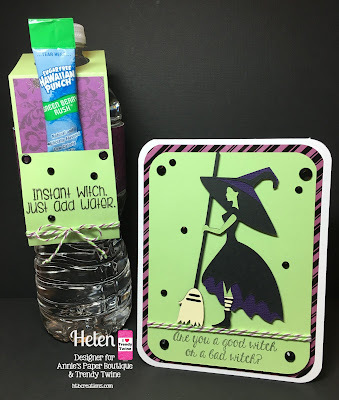 I used the same green paper from the witch, but did use a different pattern paper. I decided to wrap the pattern paper around the bottle label. And I designed the holder on my Cricut and had it cut it out and score it for me. I used some black eyelets to keep the front flap closed, stamped the sentiment on the front and added the same Lime Grapesicle Trendy Twine to it. The bottle drink packet holders are so easy to put together. I can't wait to make more! 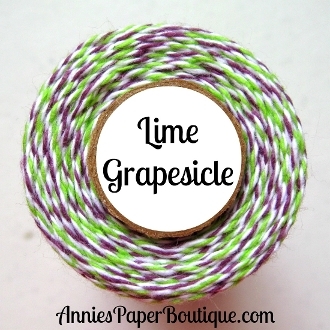 Visit Annie's Paper Boutique for these and other fun craft goodies! Super cute project, love the card with the witch! Oh I LOVE this project so much Helen, one of my favs! Simply Bewitching! Awesome card & Drink pack holder... the sentiment is such a perfect match! FUN! Have a great day!